I just want to say a couple of things. 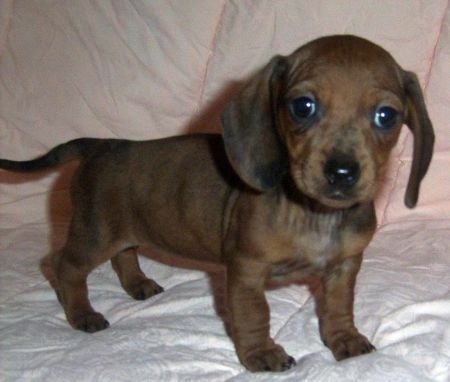 Describing what it's like to be a Dachshund Breeder is hard to do. Especially for people who have never experienced it before. I am very close to all of my little furry babies. So when one of them has their own little ones, for me it's like having one of my human children having babies. The feeling of looking into their eyes, knowing how much they trust you, is amazing. And them knowing if something isn't quite right, that you'll know how to make it better for them. For every little furry baby that is born I shed a tear. Actually that's a fib. I cry. I feel so blessed that I am able to be a part of this magnificant miracle, that I become completely overwhelmed. So needless to say it is crucial that I find families that will Love my little children as much as I do. For this I am truly grateful. Just to let everyone know that the only reason everyone is listed in the order that they will be is because of when the babies were placed in their new homes. they aren't quite sure of this... the first thing I did was try to make them as comfortable as possible. I picked the babies up one by one. Each one they looked over very carefully(which is great) to see what type of personality they had, whether they were alert, and of course how cute they were. I picked up a beautiful little bright eyed baby who was all of the above plus+++++++..... Dale looked at her and asked if he could hold her. I said yes. As I was speaking with his mom and dad and brother I noticed a gentleness not common among young men Dale's age. 18+. It was almost angelic. I knew right then and there that she (named Sasha) would be Loved & spoiled. And to me that's all that mattered. Next came Mr. and Mrs. H. (I will not put last names in order to protect their privacy). When I had spoken to Mr. H, he said his wife had previously had a Dachshund. To me this was a great sign. 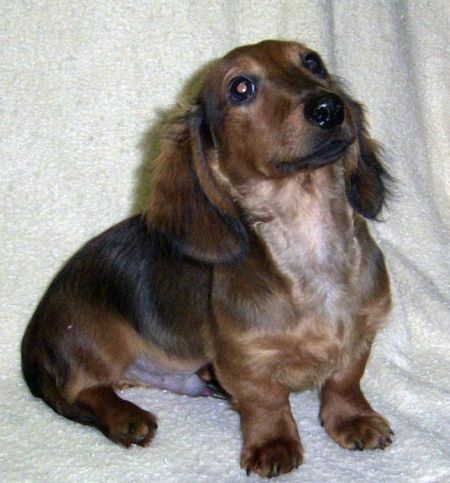 There is so much to learn about the breed, that knowing someone has already had experience with the Doxie is a bonus. When they arrived Mrs. H. seemed so happy. 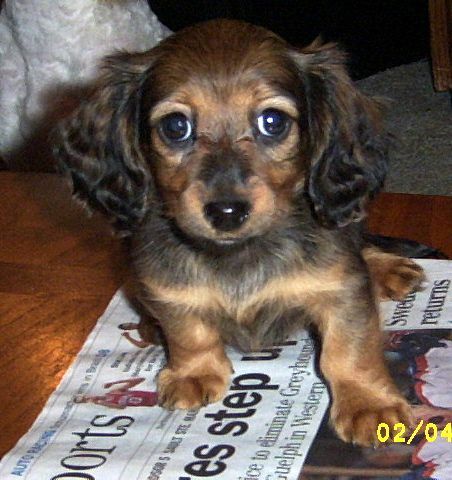 She looked at the babies with a tender fondness that only one who had previously owned a Doxie could have. They picked the little boy that they wanted (who is Pepsi) and left anxious to return. Pepsi is a beautiful little black and tan male. I will post pics of him as soon as I receive some. Then there was Rose and Bill.. What a nice couple. They came over to look at the babies. They were here for quite a while actually (which I thought was wonderful - as they were not going to rush such an important decision). They asked lots of questions. And told me they had two little people at home. They asked me how I felt about this type of breed with little people? I told them that our furry little babies are so well socialized that they would get on well anywhere. While looking at all of the new babies, one of our little sweeties came wandering by. Cocoa Puff 1. Cocoa Puff is a little darling, with the disposition of an angel. She is Loving, affectionate, very smart and of course adorable. She was 5 months old when Bill and Rose came by. By this time My Bill and I had decided that she was too small to breed. We only breed when we feel there will be NO DANGER to any of our furry little babies. So, we had contemplated putting her in a home. They (Rose & Bill) fell in Love with her immediately. I know she has the best of everything. This very Loving couple will traet her like the little Princess she is. We LOVE YOU SO MUCH COCOA PUFF!!!! Thank you Rose and Bill for giving her the loving family she truly deserves. Then there's Melissa and Chris. What an amazing couple. Like I said earlier if anyone had told me I'd meet so many wonderful people I would never have believed them. Melissa and Chris came over to see our babies. Melissa said that she and Chris had decided this was going to be their first baby. That was their compromise. We had one of our other babies in the house from another litter. One of Bootsy's babies. His name was boyfriend...now he is lovingly named WOODY. Woody has a disposition like no other. he is gentle and kind and ohhhhh, so Loving. A very distinctive personality indeed. He certainly knew how to win over Melissa's heart. And quickly. He just had to batt those beautiful little brown eyes a couple of times and welllll... the rest is history. Since Melissa and Chris have taken Woody home they have had him fixed, they sent us a beautiful thank you letter, and some wonderful pictures of them with Woody. Thank you so much for Loving Woody as much as we do... And always will...WE LOVE YOU WOODY!!!!! LORI, STEVE, NIKKI, JOSH, LYNN, AND HARV. TALK ABOUT A FAMILY AFFAIR!!!! I received a call one afternoon. Another inquiry about the puppies for sale. Typical call. Nothing out of the ordinary. The lady on the phone said she was very interested in a female. I told her we only had a male left. She said she would like to come and see him anyway. I said o.k. We arranged for HER (LORI) to come over that evening. She said she'd be here around 8:00 p.m. I had had a rather rough day and wanted to have a shower, but by the time I finished cleaning the kitchen I didn't have much time left. Approximately 15 minutes. While I was in the shower Lori had arrived. Well actually NOT JUST LORI. But instead LORI, LYNN, HARV, NIKKI AND JOSH. Like I said talk about A FAMILY AFFAIR. Sheesh... I snuck off to the bedroom to get dressed while my husband Bill entertained our company. About 5 minutes later I came out and bill introduced me to everyone. (Kinda) "This is my wife Sim." Then they basically introduced themselves. I sat down beside my husband and watched everyone interact with our babies. The first thing Lori said was, "This isn't fair. You didn't tell me you would have other babies here as well. I can't believe how good they are. Are they always like this?" That pretty much started a great conversation. We talked for a long time. Bill and I decided to sell one of our long hairs. Just because we knew she'd be too small for breeding. And we have strict rules we have implemented into our breeding program. WE DO NOT BREED ANY OF OUR BABIES IF AT ANY POINT IT COULD CAUSE THEM ANY HARM. We live by our rules everyday. This is why we have such a good solid breeding program. Anyway, back to this great story. When the family left, they left knowing alot of important information on this particular breed of puppy. Lori, her children, and mom and dad all fell in love with our long hairs. Their persoanl preferrence would have been Peanut, but we are keeping her. So the other option was Lilly and like I said ONLY because she was too small to breed. Because believe me she is gorgeous. When they left that night I had a great feeling about the whole family. Especially Lori, she was very concerned about Josh, and how he would adapt to a new puppy. Lori said she would call me tommorrow and let me know. Tommorrow did come, and she did call. She said her husband Steve wanted to come over and see Lilly. He never did end up coming. 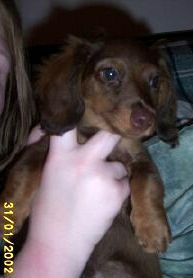 But Lori called back and said that they had decided to give Lilly a good home. She said she would be back that night to get her. And that she thought she might even leave the kids at home to surprise them. Well, guess what? I WAS THE ONE THAT WAS SURPRISED... The knock at the door came at around 7:30 p.m. Nancy ran to get it. In came Lori ....and Josh....and Nikki...and Lynn....and Harv.... Actually I was quite happy to see all of them. Thay are such SWEET people. I know Lilly will be taken care of. When Lori left that night she went to PET SMART. She bought food, toys, stainless steel dishes with bones all around the bowl (not like it matters because Lilly takes her food out of the bowl and eats it elsewhere..hehehehehe), a two tier pillow, a baby blanket...Holy smokes Lori!!!!! Wanna be my mom for a while??? :) You have a wonderful family and I know Lilly will be Loved for many years to come. Big Hugs !! !